90 minutes of Aromatherapy Massage plus 30 minutes of Body Wrap 1500 Baht. 04 Dec 90 minutes of Aromatherapy Massage plus 30 minutes of Body Wrap 1500 Baht. 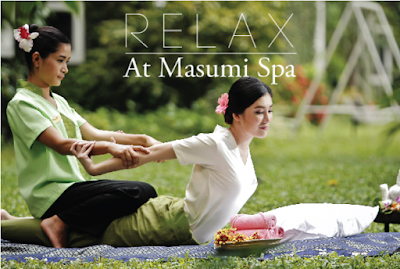 If you have been shopping all day, you might like to treat your body with a relaxing treatment at Masumi Spa. This urban style spa pays attention to every detail which, makes all the difference in the world. Located on Huay Kaew road, close to Nimmanhaemin area, the city’s dining and shopping hub, Masumi Spa offers the ultimate skin and body treatments, especially designed to release tension, pamper and nurture the whole body, bring tranquillity, balance and harmony in your busy life. Spa products used at the spa are based on plant extracts and essential oils, perfect for every kind of skin type. Among signature treatments are two-to-three hour packages designed to rebalance your body, mind and soul. Don’t miss their relaxing “Thai Traditional Massage with Aroma Balm” at 1,000 Baht for 120 minutes; or the “Jasmine Rice Body Scrub” 1,200 Baht for 60 minutes; “Hot Stone Massage” 2,500 Baht for 90 minutes or the “Masumi Hot Oil Massage” 1,000 Baht for 60 minutes. – Special promotion is until Feb. 28th, 2018, daily from 10am. to 6pm. – Credit card payment, Alipay and Aijayou are charged 3%. At Chiang Mai Orchid Hotel. 23 Huay Kaew Road. Chiang Mai.